It has been a while since I last watched an episode of Game of Thrones to be honest. I'm a "happily ever after" endings kind of person and well, the last episode of the first season was anything but happy! Despite the fighting, blood sweat and tears I still enjoy watching Game of Thrones and I've heard good things about the rest of the series both on tv and in the books. My sister is a big Game of Thrones book fan. She is a big reader so it came as no surprise to me that she had read them all. When deciding what cake to make for her 30th (kind of a big deal) I really wanted to make something big and grand, like a four tier Avengers cake. Unfortunately I had another cake to make that was due on the same day so I wasn't going to have any time. I asked my mum for cake ideas and discussed her making the cake and me making some fondant things to go on top. 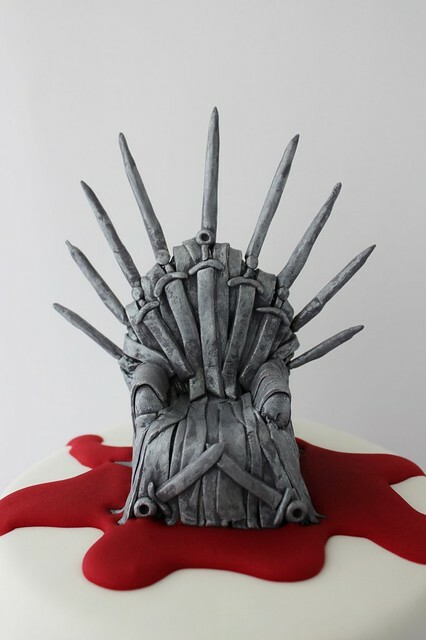 When mum mentioned making an Iron Throne for the cake and said it looked "easy enough" to make I almost laughed! 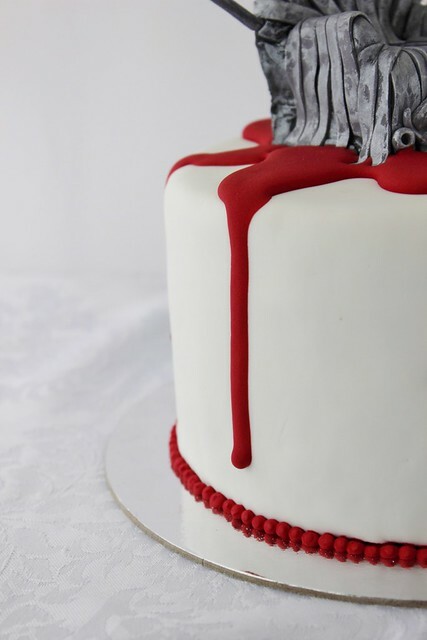 Eventually we decided she would make a plain white cake, cover it in raspberry coulis (to look like blood) and I would make some fondant swords to stick in the top. After shaping the chair I covered it in dark grey fondant. I covered several toothpicks in rolled up grey fondant and stuck them around the top of the chair then began to cover the entire chair in strips of grey fondant. Later I added the sword details and roughly painted silver lustre dust over the entire chair. 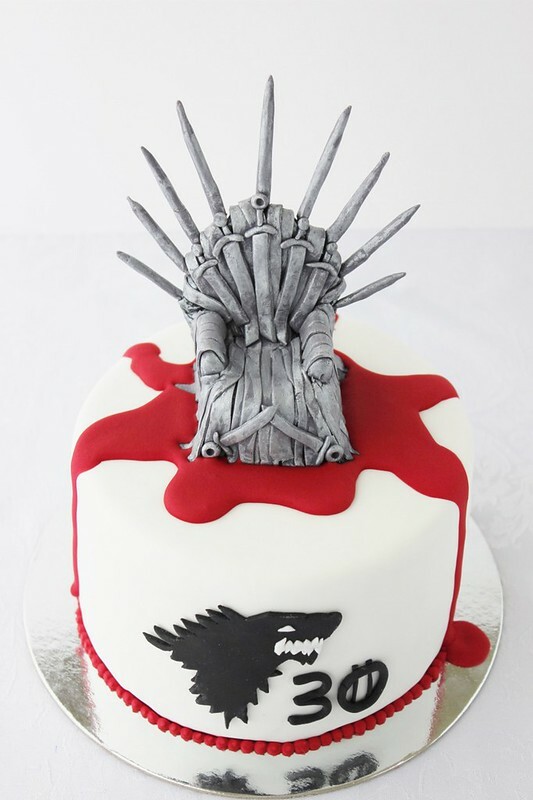 I was so wrapped with how my Iron Throne turned out I decided on the whim to make a cake after all! I whipped up a small chocolate cake, sandwiched it together with a vanilla cake I had in the freezer and covered it with white fondant. I then set to work making red royal icing, which took a ridiculously long time, not to mention used up the rest of my Red Red gel colouring! At long last I got a beautiful deep blood red. I watered it down a little then got to work making it rain blood from the centre of my cake. Is it twisted that I kind of enjoyed this part? 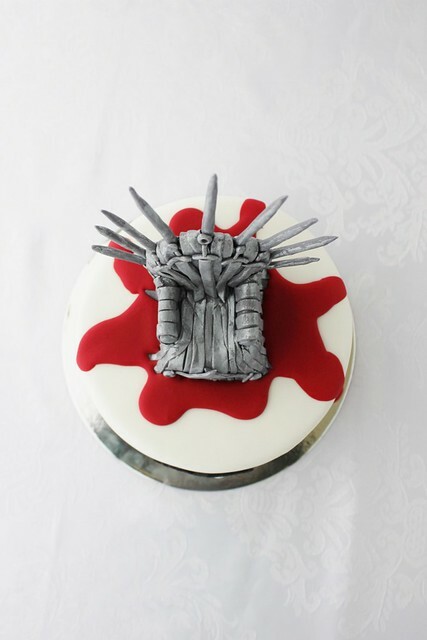 Once the royal icing was in place I stuck the Iron throne on top but I wasn't quite happy yet. It looked a little incomplete. After some Googling I found the different house logos from the Game of Thrones, I really liked the look of the dragon but I wasn't up for that amount of work so decided to stick to the wolf, which I believe is the Stark House. I like the wolves. 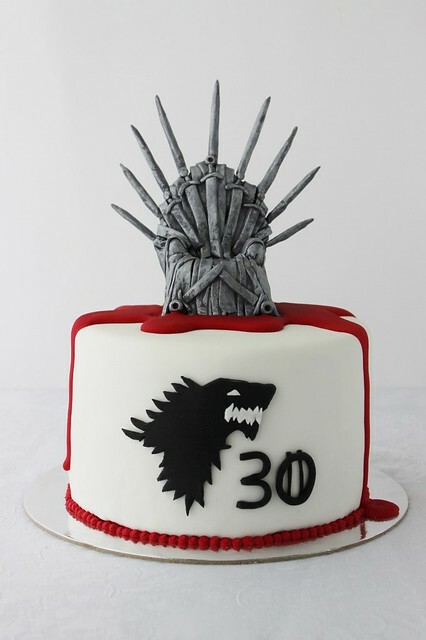 After hand-cutting the wolf and sticking him on the side of the cake I decided to add the number 30 (much to my sisters disappointment) in the Game of Thrones style with the lines through the zero. All in all I was extremely happy with how the cake turned out in the end, especially seeing as it was such a last minute decision to make it at all! I would have liked for the royal icing to have dried shinier as it looked amazing when wet, but I guess you can't have it all! I think this cake is now one of my favourites! omg!! This is absolutely amazing!! This is just stunning!! Question, how did you manage to pour the royal icing on the cake in such a neat way? I'm worried that when I come to pour it, it's just going to leak everywhere and look terrible! And there's no going back after that. Also, did it try very quickly? Thank you! From memory, I think the royal icing wasn't TOO runny, I guess you could do a trial run, I really didn't know how it would turn out, I just kind of spooned bits of icing on and then tilted the cake, hoping it wouldn't spread too far when it got to the bottom. I think the icing dried after about an hour.